Album: "Castlevania: The Dracula X Chronicles OST"
Review: Without a doubt, the Castlevania series has some of the best music in all of gaming. The foundations were laid by the talented folks at Konami decades ago, but credit for all the contemporary games belongs solely to Michiru Yamane. What can I say? The woman knows how to meld rock, electronic, and orchestral music, and make the whole thing work so well. Just as the game itself was a remake of the original Rondo of Blood, the soundtrack consists almost entirely of rearranged and remastered versions of those same songs. And when you take into account that the original soundtrack contained a number of songs from earlier Castlevania games, you’re looking at some tracks that are on at least their fifth or sixth version (and in the case of “Vampire Killer”, even much more). In particular, the reworked version of the boss tune “Tues Deus Meus” was incredible. The decreased tempo coupled with the addition of orchestral music and a choir makes it into a truly epic-sounding song worthy of playing in the background while you pepper the Grim Reaper with throwing knives. I did enjoy the original soundtrack, but a number of the songs sounded a bit too upbeat and “poppy” for a Castlevania game. Yamane’s remixes include more of the orchestral arrangement that have become as much a hallmark of the series as the killing of vampires with whips. The new arrangements also have a smoother flow than the sometimes choppy electronic tunes from the original. Those old songs are still catchy, though, and that’s the best part of this OST: it includes a disc featuring all the original music so that you can make your own comparisons. Apart from remixes of songs from the original game, there are also a pair of new songs. The first, “Moon Fight”, was a holdover from the Castlevania Chronicles, a PSX remake of the first Castlevania game. However, the second new song, “Red Dawn”, was composed specifically for this game. In spite of the name, it has little if anything to do with Patrick Swayze, but it is a fantastic song. 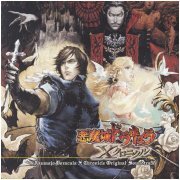 I can listen to just about any Castlevania soundtrack for some great music, but this OST is truly something special. I was disappointed that it didn’t include a remix of “Den”, a medley of several of the more famous Castlevania songs, but the other new songs more than made up for it. Plus, including the original soundtrack along with the soundtrack of the remake was a great way to acknowledge what came before, while simultaneously giving listeners the chance to draw their own conclusions about which was the better OST. Agreed Castlevania music is nothing short of awesome. Remember kids, Rondo of Blood is the last great Castlevania game before it went all RPG and became super easy. RevengeVirus is far from kidding about the difficulty. I still can't get past the Grim Reaper in the original Castlevania. Of course, I don't waste all my life playing it, since if it was the case, I would eventually beat him, but damn. The first level music "Opposing Bloodlines" is my favorite song ever, from video game or otherwise. I like this version, but I like the SNES version even more. Also, this is the best PSP game ever. EVER. Too bad Rondo wasn't that great. What, you mean Rondo of Blood, widely considered to be the best of the non-Metroidvania games, if not the best Castlevania game period? No, that couldn't be what you meant. I think it was a step down from previous 2D titles. If it had included some of the controls from Super Castlevania IV​ I would have to agree with you. Unfortunately, it didn't, which is sad because I love the character of Richter. Not to mention the anime artwork of the original game was horrible compared to earlier depictions of the Castlevania characters, and those that came after it. Well they did redo the artwork for the remake of the game. It is strange that they haven't made a game with the same level of whip control since Castlevania IV. I don't really have an explanation for that. I finished the PSP game a while back, but its definitely balls-hard. Certainly not a walk in the park that the Metroid-Vania games are. I still haven't beat the optional Hydra boss. I've played Rondo, and it is highly overrated. The level design isn't that great, mostly because it's fairly devoid of jumping challenge and it doesn't have much drive. The fights against some of the enemies are fairly exhilarating (the axe armors in particular), but the lack of Super style controls cripples the combat (and the game even) from being amazing, rather than just good. I actually like Dracula X (the SNES remake) more, because even though the game has some truly wonky level design (screw the guy who put pits in level 3 and during the Dracula battle), it equally has good level design (like more exhilarating levels 1 and 2, most of level 5, and a few other areas) and makes a bit more of Rondo's punchy combat. I've recently played Bloodlines , and I'd say that that game and Super are tops in Castlevania-land. Woe is Bloodlines that it is somewhat forgotten because it was released on the Genesis rather than the Super Nintendo. It really shouldn't be, because in terms of a pure rollercoaster experience, it is the best Castlevania. It also is Yamane's first Castlevania ST, and one of her best (only OOE is real competition for me). Castlevania games always have great soundtracks. As for the remake itself, its alright, but I prefer the original version more. It just looks and plays better. Anyone who prefers that butchered SNES version is an idiot. But overall, Castlevania has become even more stale than Mega Man. Ever since adopting Metroids gameplay, it hasn't been anything different. I know this is partially because it hasn't been able to jump to 3D like Metroid has, for example, but still, does anyone really get excited for the next Symphony of the Night clone? Well I do, and the sales for Order of Ecclesia far outshone Judgement, and in all likelihood, Order of Shadows will be outdone by whatever the next 2D Castlevania is. And it's fun. It's just like any other 2D series. The basic gameplay remains the same; the big changes are made to things like enemy design, level layouts, weapon usage, and things like that. Think about the Contra series: you move through each 2D level grabbing one of a handful of recurring weapons and shoot the hell out of everything. With the exception of the few ill-fated 3D games in that series, they've managed to keep things fresh by tweaking the weapons and giving you new enemies and boss fights. Anyway, you really are missing out by not trying the newer Castlvanias. Super Metroid has a good system going for it, but I enjoy Castlevania's take on it because there's more variation in the kinds of things you can find (weapons, powerups, etc). Also, I always found it annoying the number of times you had to shoot a small, randomly-selected piece of the wall in order to find things in Metroid. You mistake excitement for dislike. I think the handheld Metroidvanias are great games, just nothing to get very excited about. Dawn of Sorrow, on its own, is a refined, heavily polished game thats one of the best on the DS, but to someone who isn't familiar with Castlevania, you can take a screenshot of it and compare with with a screenshot of SOTN, and you couldn't tell the difference. And they are eight years apart. That's why I don't really pay attention to Castlevania anymore, because it's just the same thing over and over again. And overall, I prefer when Castlevania was Castlevania and not trying to be Metroid. Don't get me wrong, SOTN is an amazing game, but I still prefer the older Castlevanias and Metroid. But that's just me. I think Symphony of the Nights approach wasn't all that much fun, and I didn't even end up using more than half of the things you acquire in Symphony of the Night, and I've never gotten 100 percent of the stuff. It's all extra baggage to me. A lot of the game was far too easy and it just didn't have the same impact Super Metroid had on me. I've played Super Metroid like over a million times, but I've rarely got back to play Symphony of the Night. Again, just me. To each their own. You say that Dawn of Sorrow was this great, well-made game, then complain about how someone not familiar with the series would mistake it for SOTN. First off, I assure you that if the screenshots up for comparison had included some of the closeup artwork of the character, even a layman would be able to tell the difference between SotN and DoS. More importantly, though, my response to that is "So what?" As you said, they're both great great games. It sounds like you're suggesting that people shouldn't be excited about the next 2D Castlevania unless it looks radically different. I hate to be the bearer of bad news, but that same argument could be used against the old Castlevania formula as well. Rondo of Blood plays almost exactly the same as Castlevania III, but that doesn't mean you shouldn't be looking forward to the next old school Castlevania. In fact, that reasoning pretty much precludes all the Castlevania games except for the experimental 3D ones, and if those are all a person is playing... well, they won't much care for the series. I said it was a refined, polished game. And great in my opinion is not excellent. Great means playing casually when you're bored on a subway or it's a rainy day and you can't go outside. Not something to get enthralled in, but then again I don't think there is a way someone could have known that right off the bat, so I apologize for the confusion. I guess I should have said solid game, I guess that's a more apt description. And I don't think game artwork reflects how the game actually looks, not all the time. Honestly, other than I guess the top screen, the game doesn't look any different. And who cares? Well, I was just illustrating how they aren't different and why I don't care to keep up with the series still and probably never will again . No, I never said no one shouldn't be excited for anything, I said why I am not excited for something. There's a difference. I couldn't care if that's all someone played was these Castlevania games on the handhelds. I couldn't care less, I was just stating my opinion on the matter. I hope you didn't get offended by it or anything. I wouldn't honestly look forward to the next old school Castlevania either..I think you misunderstood me. I don't think I'll be playing that Wii one for years to come, but I mean there was much more difference between the old school ones than the metroidvania ones. I mean Rondo of Blood is different from Castlevania IV which is different from Bloodlines which is different from Castlevania 2, and that's just in a six year timespan. I think there's been seven or so metroidvania ones, and they don't seem terribly different. But that's just me, I don't really care too deeply about the new ones, and probably never will again. Casltevania games, old or new, overall are a bit overrated to me. The controls are bit wonky and most of the difficulty is usually rooted in that (I guess except number IV). Plus I'm not really into the whole gothic horror thing, so when I say I like one better than the other, it doesn't mean I put that one on a pedestal of excellence. I think Dracula X and SOTN are the only one I'd really put on some list of favorite games of mine, but even then, they have issues. I admit I wasn't really getting what you were saying. What I'm getting now is that you like the music of Castlevania, the games not so much. And so I say "fair enough". I think my first comment was confrontational, which was stupid, I think I was coming off like, "How can anyone like Castlevania these days." I apologize, all I was saying I like SOTN but I dont care to play it repackaged. That's all, have a nice day. What is your avatar anyway? It's the title character from Chakan the Forever Man. I like Castlevania: Symphony of the Night and Super Metroid equally, and I think the new Castlevania games are pretty good, to various degrees. Don't see why people fight over that. Oh yeah, and good soundtrack too. I like the 16-bit one more though.